One of the most spectacular feeding events observed in Mandurah’s waters is the octopus toss. It’s only observed a few times a year and to capture the moment on camera you have to be very lucky! Our dolphins eat octopus but they can’t just catch it and swallow it whole, like most fish, as it could result in death. Octopus tentacles are very dangerous to predators as they are covered in suckers which could choke them. 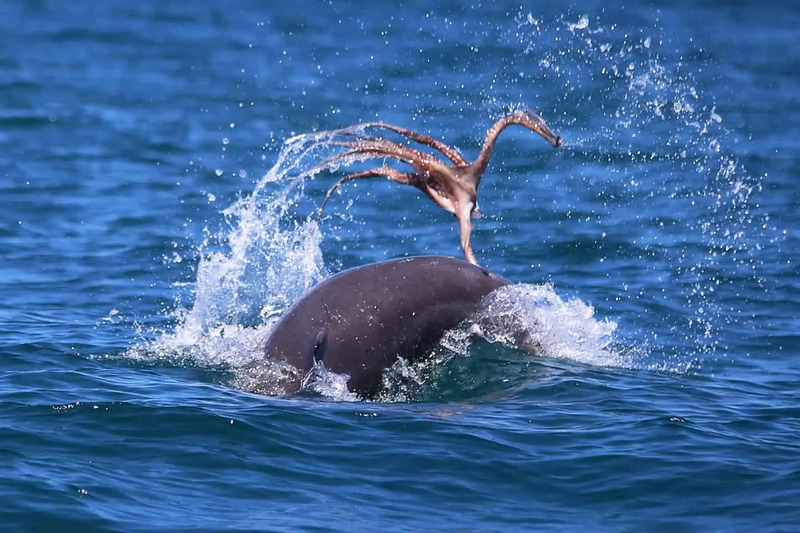 So to ensure it is safe to swallow, the dolphin tosses the octopus around multiple times to break it apart, wear out its reflex responses and disable, dismember and tenderize its tentacles. The octopus will often try and defend themselves with their suckered tentacles by latching onto the dolphin’s smooth skin on their back, where they can’t grab them. Our crew have observed two dolphin tosses this year. The first occasion was a dolphin named ‘Scooby’, in the ocean out of Dawesville Cut. Photos captured by Natalie Goddard. The second octopus toss was witnessed on 23rd March and was captured on film by our tour guide Kat. The dolphin wasn’t identified but after tossing the octopus around bow surfed with it in its mouth. See the video below. Another marine creature in the Mandurah estuary that is ‘tossed’ is the cobbler (also known as catfish). Cobblers are bottom dwelling, scaleless fish that have venomous spines on their fins. To disable the use of these poisonous spines the dolphins toss them multiple times to make it safe to swallow. The consumption of cuttlefish by dolphins has only been reported in four places around the world – Bunbury in Western Australia, Spencer Gulf in South Australia, Sado Estuary in Portugal and Mandurah. The dolphins go through a lengthy procedure to prepare the cuttlefish to be safe to eat. They bring the cuttlefish to the surface, remove their head and tentacles and squeeze its body with their teeth to shoot the ink out, before placing the cuttlefish body over their rostrum (beak) and removing the cuttlebones, to only eat the remaining soft flesh. In late April/May each year we experience the ‘salmon run’ along the Western Australian coast. The salmon head north from Esperance to Perth in massive schools. When they reach Mandurah, the dolphins enjoy a feeding frenzy. They will pursue them against rock walls or herd them into a tight ball with their group and attack from all sides on cue. Dolphins have teeth but only use them to grab their prey not chew it. They generally swallow their catch whole and head first. Salmon are such a large fish however, so this isn’t possible to do. So, they will typically throw the fish around, smash it on the water’s surface or push it down in the water or to the sea bed to break it into smaller pieces to eat. Mandurah’s dolphins live in a shallow system where mullet are plentiful. To catch these fish in the shallows they have developed a technique called the ‘tail whack’. The dolphin will swim rapidly along the surface (often rooster tailing) before stopping abruptly and spinning around, swinging its tail fluke sharply. The stunned fish can then be seen flying through the air before being picked from the water’s surface. One of our most well-known resident dolphins ‘Christmas’ is regularly observed using this technique. A commonly used technique for catching smaller fish is called ‘snacking’. The dolphin will swim belly up near the surface and pick off the small fish. They do this belly up as they can’t look upwards – only forwards, backwards and to the side. When a group of dolphins are observed using this technique it is referred to as a ‘snack party’. As you can see, Mandurah’s dolphins exhibit a remarkable variety of foraging strategies. They are passed on through generations by way of mothers teaching their calves or learning from other dolphins they associate with in adulthood. If you have any questions please comment below and we’ll have our expert dolphin team answer them. Previous Previous post: Topnotch is a mum again!